We’ve discussed the often maligned grey flannel suit and the navy blue suit as wardrobe basics. However, if forced to travel with only one set of clothes…. well, I’d have a nervous breakdown. But, hypothetically speaking, the most bullet proof combination I can think of is the double-breasted blue blazer and grey flannel trousers. The picture above is from Ben Silver and shows varying degrees of darkness. Me? I like a charcoal grey flannel trousers best. Flannel is a corruption of the Welsh word “gwalnen,” which means woolen. It is a soft fabric made of loosely woven, lightly twisted yarns that hide the weave. Originally, flannel was used for undergarments, then sportswear and eventually it became popular for casual suits. Like all menswear, its comfort was the chief reason for its popularity. Flannel may be made of cotton or wool. Fred Astaire used to wear a union suit of flannel under his dancing clothes… and we can’t abide 14 oz. wool! 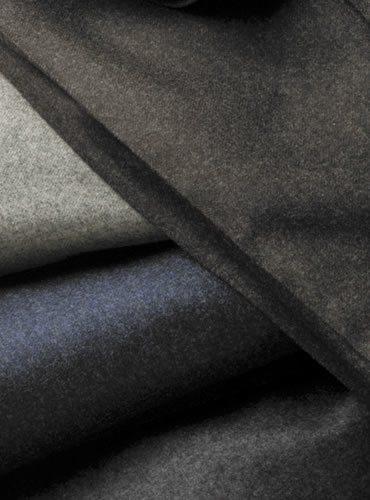 Speaking of wool, that’s what you should opt for: grey, wool flannel trousers. Flat front or single pleats, the choice is yours and both are entirely correct. Flat fronts were popular in the 1970’s at Brooks Brothers. 1930’s pleats and fuller legged versions came back into fashion during the 80’s. Stick with a moderate leg (naturally tapered.) Cuffs are again up to you. Some Continentals would opt for plain bottoms; we like cuffs for the most part. Italians wear thinner legs and wider cuffs. The English may like turn-ups, as they call them, or not depending on the fashion of the day. I tend to wear cuffs as the extra fabric adds weight and therefore helps the fabric to hang better. Pair your grey flannels with chocolate brown suede shoes for day and a classic slip-on in black for night. Follow up with a blue shirt (especially with a white club collar and cuffs) or an all white shirt with cutaway collar to showcase your striped tie under your DB blue blazer. You will always be well-dressed. Provided that you remember your pocket square. This entry was posted in Elegantology and tagged clothing, Elegantology, flannel. Bookmark the permalink. Superb site. I prefer medium grey flannels with cuffs and a flat front. The lack of pleats helps accentuate my height and leanness. Thank you very much. It’s fun working without a net sometimes. I’ve enjoyed your commentary on other blogs very much. I’ll look forward to poking around your blog for insight and inspiration.